For the last 6 months I have been on a quest to purchase a new fountain pen. I wanted to purchase something different to the Lamy Safari which I have been using for sometime. While on a holiday in Birmingham with my wife I stumbled upon “The Pen Shop”. This is where I was introduced to the brand called “Waterman”. The staff member was really helpful and presented the “Waterman Hemisphere” for me to try out. After doing a few writing samples with this pen I had to buy it. Fast forward to the present and I still think I have found my favorite fountain pen! What I really like about the Waterman Hemisphere is the look of it. The black coating that covers the cap and barrel has a reflective finish and factor in the silver trims that is used, this looks an expensive fountain pen. While feeling a well made pen it doesn’t feel heavy in the hand which makes it a very comfortable pen to write with over long periods. Another plus is that it can take a converter which means you can use bottled ink. I have my converter filled with Pelikan Brillant Black. The nib hasn’t felt scratchy at any point and the ink flow has been good so far. One thing I have noticed is that the nib does flex a little depending on how much pressure you exert on the pen while writing. A few minor niggles I have with the Waterman Hemisphere is that I find the Medium nib a tad to thick for my taste and there always seems to be small spots of ink on the actual nib itself. I haven’t really looked in to this to see if it is a common issue with the Waterman nibs. I might also look into swapping the nib out for a finer one later. 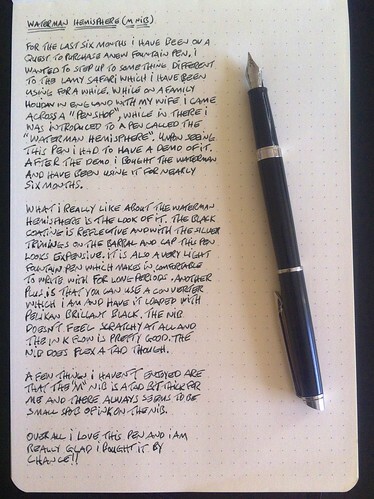 Overall I love the Waterman Hemisphere and I can’t see me buying a replacement Fountain Pen for a long time.